This paper explores the ways that critics writing in the early nineteenth century developed arguments in favor of what we think of today as the humanities in the face of utilitarian pressures that dismissed the arts as self-indulgent pursuits incapable of addressing real-world problems. 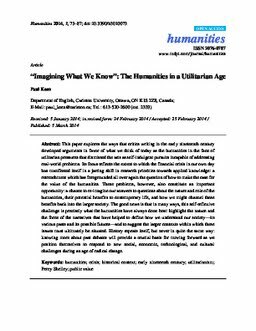 Its focus reflects the extent to which the financial crisis in our own day has manifested itself in a jarring shift in research priorities towards applied knowledge: a retrenchment which has foregrounded all over again the question of how to make the case for the value of the humanities. These problems, however, also constitute an important opportunity: a chance to re-imagine our answers to questions about the nature and role of the humanities, their potential benefits to contemporary life, and how we might channel these benefits back into the larger society. The good news is that in many ways, this self-reflexive challenge is precisely what the humanities have always done best: highlight the nature and the force of the narratives that have helped to define how we understand our society—its various pasts and its possible futures—and to suggest the larger contexts within which these issues must ultimately be situated. History repeats itself, but never in quite the same way: knowing more about past debates will provide a crucial basis for moving forward as we position themselves to respond to new social, economic, technological, and cultural challenges during an age of radical change.